As we bid adieu to 2018, we kick off the brand-new year, with better opportunities for bakeries, new and improved strategies to allure the customer and smarter ways of marketing. Last year saw an influx of world cuisines into the QSR(Quick Service Restaurant) segment and it was given a warm welcome by the masses. Having said that, the potential that these products could reach is enormous and we have only scratched the surface. 2019 holds many surprises, challenges and innovations for the bakeries in the current competitive market providing unique product offerings and implementing customer centric approaches in their businesses. Our bakery predictions for this year range from methods adopted by bakeries to increase their reach and ingenious ways of publicising themselves, to product creativity, newer methods of delivering them and quicker alternatives to traditional methods of preparation. We have listed these in detail below. Ever since products like the waffle and pancake have become household names, bakeries have gained confidence and taken the initiative to tweak the product thus creating interesting combinations like the ‘tiramisu’ waffle, ‘snicker’ waffle, ‘nutties’ pancake, ‘oreo’ pancake to name a few. However, there is further room for development in this area and one can easily create a whole range of variations using a little imagination. Combining two treats could result in a product that is an amalgamation of taste, texture and looks. 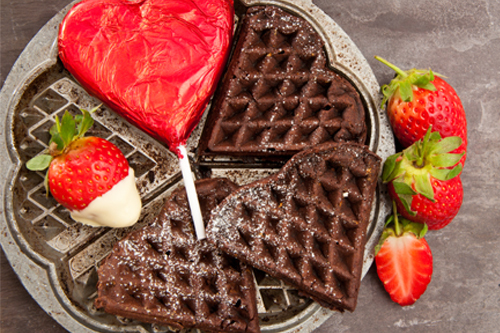 An example of this would be the ‘brownie waffle’ which has the taste and texture of a brownie and the look of a waffle, thus successfully combining two popular deserts into one delish goody. Sweet and savoury treats that maybe street foods in their original countries have the potential of forming their own chain of outlets in a market that is craving for delectable, on the go goodies. In a country where celebrating occasions are an excuse to feast, bakeries have a huge opportunity to fill the gap with the choicest of ambrosial foods from across the world. 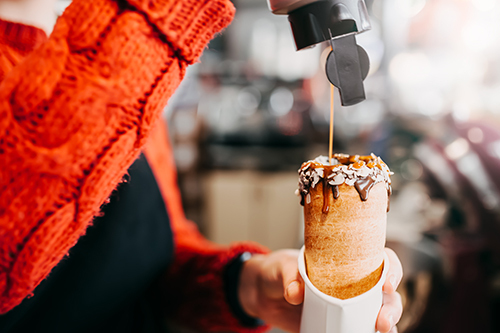 The latest to join the bandwagon of global foods is kurtos or chimney cakes. Originally from Hungary, these fermented, sweet, cone-shaped treats are roasted over charcoal(or electric chimney) to a golden brown colour and used as a base for ice creams, fruits, cheese and many more. There are a plethora of markets yet to be explored that can be commercialised into mainstream businesses and the scope is tremendous. Almost all of the global foods that have entered the market have been made to feel exceedingly hospitable in our country and the crowds outside their outlets are only proof of this. In a nation which has a penchant for different tastes and cuisines, bakeries must use this opportunity and expand their businesses by opening new outlets in different cities across the country thus allowing people from all parts of this dynamic nation to experience international delicacies. Most of the current outlets of various chains of businesses have been opened under the franchisee business model and have a higher success rate as opposed to the chain business model. It allows for faster expansion of business without the multiple figure investments and is perfect for the exponential growth of the brand. Many bakeries have adopted this model and have so far proven to be a hit as more and more outlets are opening all across the country at a rapid rate. 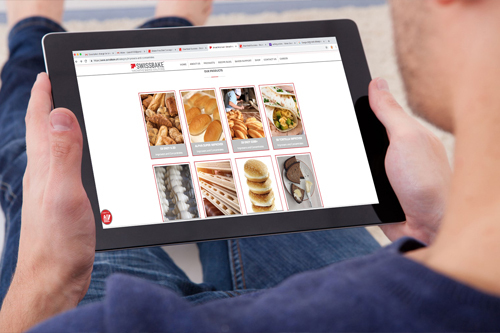 With food delivered to our homes at a few clicks, small bakeries can rely on the bankable concept of online selling to expand their business. When opening new outlets is not feasible due to stringent budgets, marketing oneself online will help to increase the market reach without investing multiple figure numbers. Having an online presence will open up new markets and thus more opportunities for business helping the bakery grow by increasing sales. 2018 saw the dawn in the implementation of the digital delivery system and 2019 will only allow the consumer to choose from a larger variety of such services, each trying to outdo the other in terms of product offerings and discounts. Though this concept is relatively new, it has the potential to replace the current methods of delivery due to its ease of operation and ability to provide a diverse range of products all under one roof. Bakeries will benefit from this model by collaborating with these companies as more and more people are signing up for such services thus, in turn, creating awareness of products the bakery has to offer. Since most of these services use different tactics to allure the customers it is only a matter of time when a majority of the consumers will start ordering through these platforms making it even more practical to join this latest phenomenon. Other than this, traditional methods of delivery continue to operate parallelly but due to limited market reach, this method is slowly dwindling making way for the extremely efficient and competitive digital delivery system. While the impression that a scratch recipe creates can in no way be replaced by one using mixes, use of both is dependent upon the type of bakery and the volume of consumers it caters to. A small bakery in the locality will have fewer customers and hence scratch recipes passed down from generations can be used in the endeavour of baking authentic products that are a class apart. However, if the bakery caters to a larger audience then scratch recipes may not be an ideal option. The reason being that with a larger setup, consistency of flavours and textures of baked products is of utmost importance and this can only be achieved by using mixes. Not only is it cost effective and less time consuming but it also allows the bakery to concentrate on other aspects of the business like advertising and brand building. Usage of mixes assures that there is negligible error and the technicalities involved in baking are reduced tremendously, making it easy to prepare and bake products for the masses. Small batch artisan breads will be in high demand due to its authentic original flavour, clean ingredients and health benefits. There is a section of customers that values artisanal breads and appreciates the time and effort that goes into baking them from start in small batches. 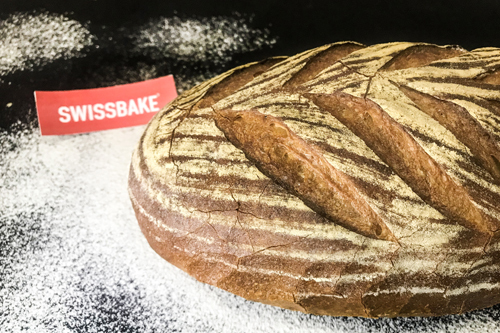 Though the volume is low, the artisanal bakery industry will flourish because of the high demand and the willingness of the customer to pay premium for preservative free, clean label and flavourful artisan breads. Those for whom superior quality of baked goods is top priority, an artisanal bakery is the place for them to go and relish the authenticity of traditionally baked products.